Habitat: Leopards are found in sub-Saharan Africa, northeast Africa, Central Asia, India, and China. However, many of the leopard populations are endangered, especially those located outside of Africa. 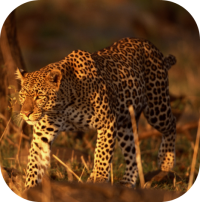 Leopards are found in rainforests, grasslands and mountainous regions. 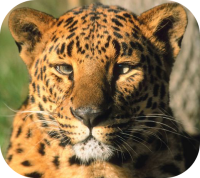 Leopard Species: There are currently nine subspecies of leopards which are recognized. Size: Male leopards are larger than their female counterparts. Leopards measure 3 to 6 feet in length with a tail 23 to 44 inches long. Male leopards weigh 80 to 200 lbs, and females weigh 62 to 132 lbs. 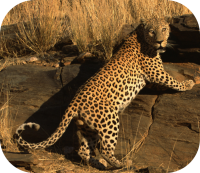 Conservation Status / Population: All species of leopards are threatened or endangered. 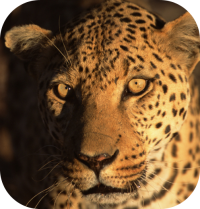 Diet: Leopards are carnivorous predators they will stalk antelope, deer, and pigs. Senses: Leopards have exceptional hearing, they are able to hear the squeak of a mouse. 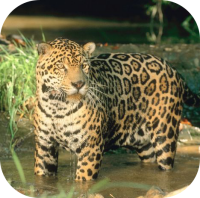 Description: Leopards are sturdy, athletic big cats. Most leopards are light dusty colored, with dark rosette like spots. Black leopards, which are almost an entirely solid color, are commonly called black panthers. Behavior: Male leopards have a home range of approximately 12 square miles, where a females home range is closer to 6 square miles. Birth: Leopards usually give birth of 2-3 cubs or kittens at a time. Leopard cubs are only a single pound at birth. They are completely helpless at birth. While snow leopards and clouded leopards have the word leopard, in their name, they are not true leopards and they have own classifications within the cat family. Gestation: Leopards carry their young for 3-3.5 months. Cubs: Cubs are weaned at 3 months of age. 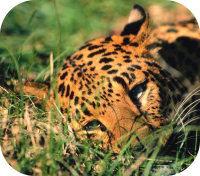 The mortality rate of leopard cubs is estimated between 40�50%. Sexual Maturity: Leopards are sexually mature around the age of 3. Life Span: Leopards live 12 to 15 years in the wild and they will live up to 23 years in captivity. Social Structure: Leopards are solitary except for when breeding or rearing their young. 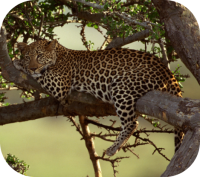 Athleticism: Leopards will often haul their kills into trees for snacking and napping. Leopard will also hunt from trees, leaping from the tree on to their prey. Leopards are excellent swimmers and leopards will also eat crabs and fish. Leopards can reach speeds of 30 mph.